If you have been following our travel blog, you know that sometimes independent budget traveling can be challenging. Hours upon hours on crowded busses bouncing along unpaved roads, eating unrecognizable foods prepared under questionable sanitary conditions, long bouts of travelers’ diarrhea, moving from one accommodation to the next (sometimes not staying two consecutive nights in the same place for a week straight), seemingly endless hours of free time spent planning travel logistics (booking busses, accommodations, etc. ), and being woken up by blaring techno music or window-rattling firecrackers in the middle of the night. These are just a few of the nuisances that come with the territory. I know what you’re thinking: First world problems, right? Well, yes, that’s true. Don’t get me wrong. We’re incredibly fortunate to have the ability to travel the world. There has not been a single day since we left our lives back in Sacramento many months ago when I haven’t taken a moment to reflect on how lucky we are to live the lifestyle we’re living. The truth is, I wouldn’t trade it for anything. Nevertheless, the challenges of day-to-day life on the road can take their toll and strain the resolve of even the hardiest of travelers. Given these challenges, one sometimes wonders: Why? Why not opt for a cozy bed in a familiar home with your favorite comfort foods on the dinner table and the company of your dearest friends and family around you. Why leave all that behind to venture into the unknown and unfamiliar? While there are several reasons (such as the personal growth that comes from being exposed to different people and ways of life or the growth of my relationship with my travel partner, best friend, and wife, Elena), one of the things that inspires me to keep going when things get tough is the pursuit of what I like to call the “perfect travel moment”. These are the moments when all the stars seem to align. When all the travel stresses melt away and I am truly living just for that moment. These are the moments that give me goosebumps. These are the moments when it’s all worth it. All the long hours on the road, all the creature comforts left behind, all of it. The following is a list of my favorite travel moments from our first eight months on the road. It is pretty diverse. Some of these moments were inspired by beautiful sights, both natural ones and man-made. Others were inspired by connections I made with other human beings, ranging from my closest family to virtual strangers. Some are inspired by the richness of cultures that seem very foreign but yet at the same time strangely familiar. What they share in common is that all of these moments moved me deeply and that I immediately knew, even in the moment and without the benefit of hindsight, that I was forming memories that were embedding themselves deep into my psyche. They are moments that literally gave me goosebumps. Collectively, I think these moments form the most coherent answer to the question of why I travel. Here they are, in chronological order. We were feeling pretty bedraggled after having driven 600 miles over the last couple of days. 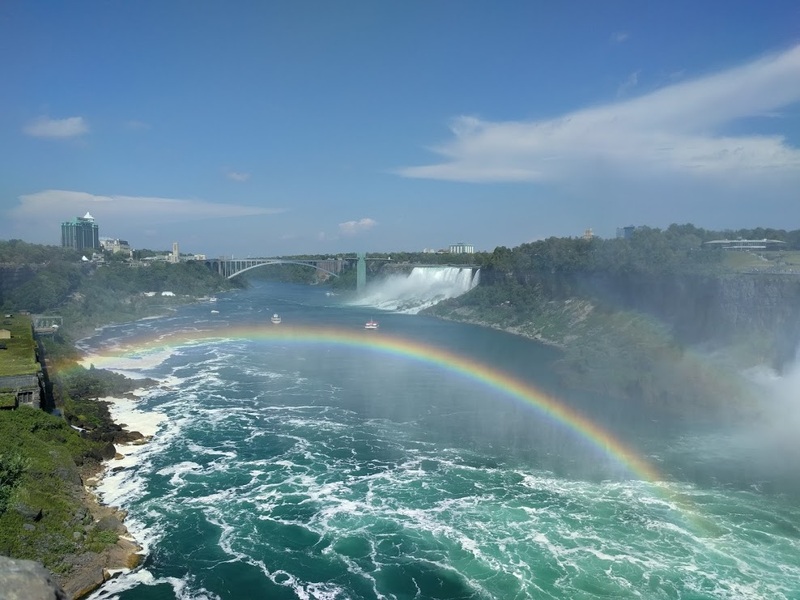 We were headed to Buffalo to spend a couple nights with our dear friends, Lou and Melinda, and decided to stop at Niagara Falls on the way. It was extremely hot and humid and we were in desperate need of a shower. At that point, the main selling point of the mile long walk from our budget parking lot to the falls was the dense cool mist we could see emanating from the falls, not the famously epic views, which had yet to reveal themselves. However, when we finally arrived, hot and exhausted, at the falls we were greeted by view so stunning I have no words to describe it. Just as we began to relax and take it in a huge rainbow suddenly appeared. It seemed as though the falls were donning their finest Sunday dress to impress their new guests, and they succeeded. This is the one moment among this group that is arguably a bit unlike the others since it occurred at a family gathering in the U.S., rather than some far flung overseas destination. However, I’m including it since it took place on the first leg of our travels, our cross-country road trip in the US. This moment was extremely special to me because my opportunities to see my grandparents have been too few and far between since I moved to California over a decade ago now. 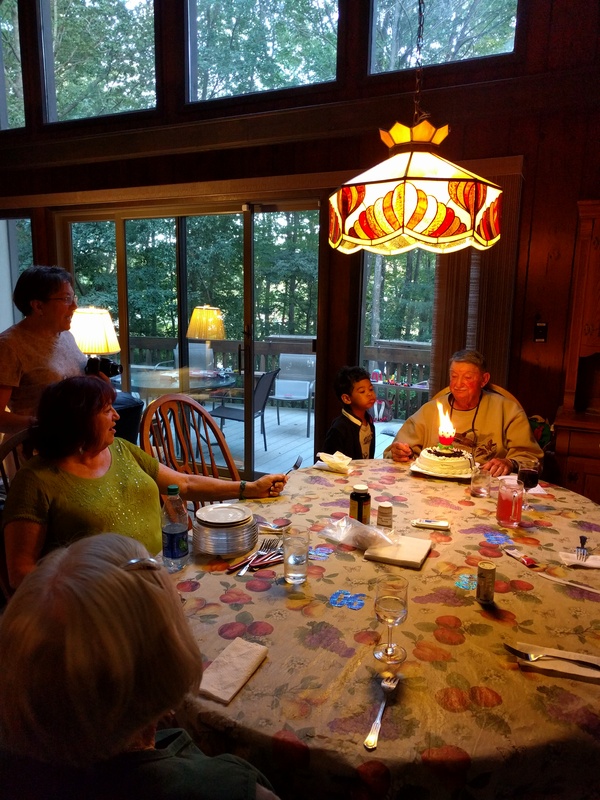 Seeing my grandfather, whom I admire greatly, surrounded by all of his children, grandchildren, and great grandchildren as he celebrated his 90th year of life was deeply meaningful for me. I believe that in many respects the value of our lives can be measured by how much positive influence we impart on those around us. If I am able to accomplish half of what my grandfather has in that respect by the time I reach his age (assuming I’m fortunate to stick around that long), I will consider my life very well spent. We had just finished up our week at a resort on the coast of Oaxaca in southern Mexico where Elena was working as a Zumba instructor. Staying at an all-inclusive resort is not my preferred mode of travel for a variety of reasons. I won’t delve into all of them here but suffice it to say that I find it very difficult to meet and interact with local residents and learn about their culture in a non-superficial way while staying in a resort. 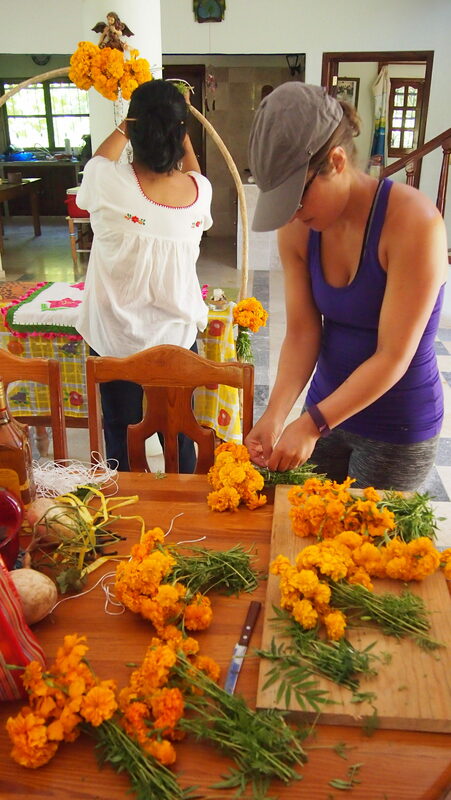 Anyway, after spending a week cooped up at the resort, I was yearning for a cultural experience and the timing was perfect because we were coming up on a very unique Mexican holiday, Dia de Los Muertos (The Day of the Dead). We set about emailing some Airbnb hosts in the area to inquire as to whether there were celebrations happening in their towns. 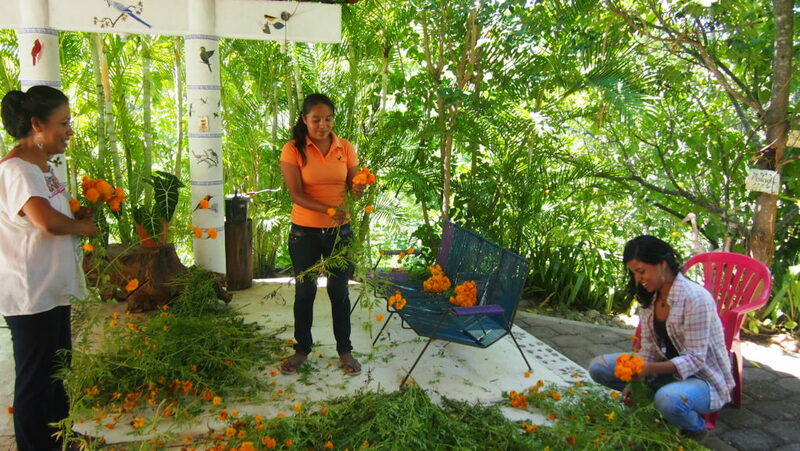 One host responded quickly to let us know that there were in fact celebrations in her town, Santa Maria Huatulco. Moreover, she invited us to celebrate the holiday with her family. We leapt at the opportunity. 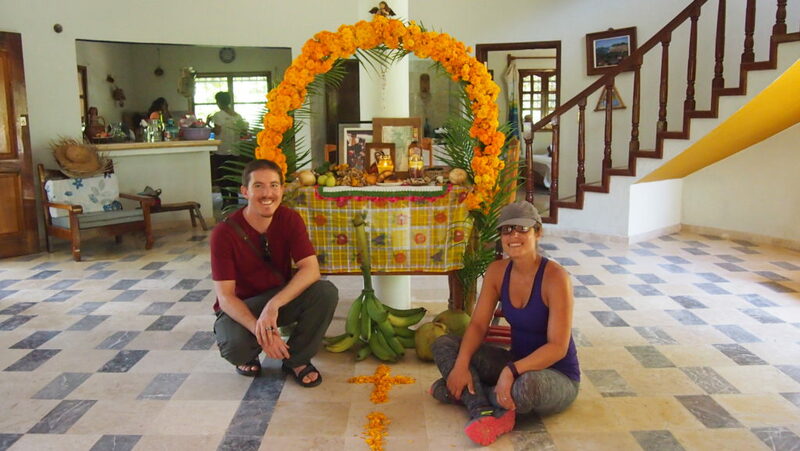 A few days later we found ourselves helping our host, Gracie, and her family construct an altar in remembrance of her younger brother who had just recently passed on. After finishing the altar we sat with the family as they explained to us the importance of the holiday and what it meant to them to honor the life of their son and brother. It was a powerful moment for me, as I was struck by the simultaneous realization that while the method for mourning was very distinct and unique from American traditions, there is also something profoundly universal in how all people cope with death and the loss of loved ones. “We’ve got a special treat planned for you today,” said Victor in his usual, energetic tone. Also, as per usual, our host was a bit cryptic about what to expect. We were several days into our week as volunteer teachers at Victor’s school and had become accustomed to the middle-aged Mexican’s free-wheeling, fly-by-the-seat-of-your-pants, adventurous nature. We’d learned by this point not to bother asking questions and just go with the flow. So while we didn’t know what exactly was coming, we figured it would be fun. We also suspected we’d be getting yet more insight into the rich cultural tableau of Tehuantepec. We knew nothing about the town before we arrived. You’d be hard pressed to even find it mentioned in any guidebook and by the curious looks we got walking around town, I suspect not too many gringos find themselves in this remote corner of southeastern Oaxaca. Nevertheless, we really came to appreciate the town, mainly because we were seeing it through the eyes of our host, a lifelong resident and the town’s proudest evangelist. Whether we were sampling the culinary delights of Oaxaca at his favorite tlayuda and garnacha joints, cruising around town with him while he pointed out landmarks, or chatting about the unique traditions of the Zapotec people who have inhabited the area since long before the Spaniards arrived, Victor’s encyclopedic knowledge and fierce pride for his hometown was obvious. As it turns out, we were right to be excited for our special treat. Victor had arranged for one of our students (who also happens to be a professional musician) to play us some traditional Mexican songs on his trombone. The last song he played, called La Sanduga, is a sort of unofficial anthem for the people of the Tehuantepec region. It’s a powerful song about a Zapotec woman mourning the death of her mother. As he masterfully channeled the sorrow of the mourning woman with his trombone, I could feel her despair. We knew it would be hard being away from family for the holidays, and it was. I think it was especially challenging for me to not be in New York with my family because I had managed to make it there every year, even after moving to California ten years ago. Knowing this, Elena and I did our best to remind ourselves that the separation was temporary and we’d be home with our family next Christmas. We also did our best to embrace the once-in-a-lifetime opportunity to experience local Christmas traditions in Antigua, Guatemala, where we sort of randomly wound up on Christmas Eve. We were fortunate to find ourselves with a hospitable local family who warmly invited us to partake in some of their traditional Christmas dishes (which you can read about here). They also advised us that there would be an impressive fireworks show at midnight. Given the Guatemalans’ proclivity for large, noisy fireworks displays (which we’d seen frequently over the last several weeks) we had an inkling it would be worth staying up for. Still, nothing could have prepared us for what we were about to experience when we found ourselves on a rooftop in the middle of Antigua at the stroke of midnight. The entire city erupted into a 360-degree panorama of explosions that went on for 10-15 minutes. It was a sight and a moment I’ll truly never forget. The hike to the base camp just below the summit of Volcan Acatenango is not for the faint of heart. I had just slogged basically straight up the side of the volcano covering about 1,900 vertical meters (over a mile). At times the trail is covered in volcanic ash (the remnants of millennia of eruptions) so thick I slid down one step for every two steps I took. I spent most of the day hiking through dense cloud cover which continued to obscure our views when we arrived, exhausted, at the camp. I had barely plopped down my bag and pried off my hiking boots when suddenly the clouds parted and revealed the majestic Volcan Fuego. Right on cue it became to erupt spewing a massive cloud of ash high into the sky. The Great Pyramid of the Lost World (constructed around 500 BC). 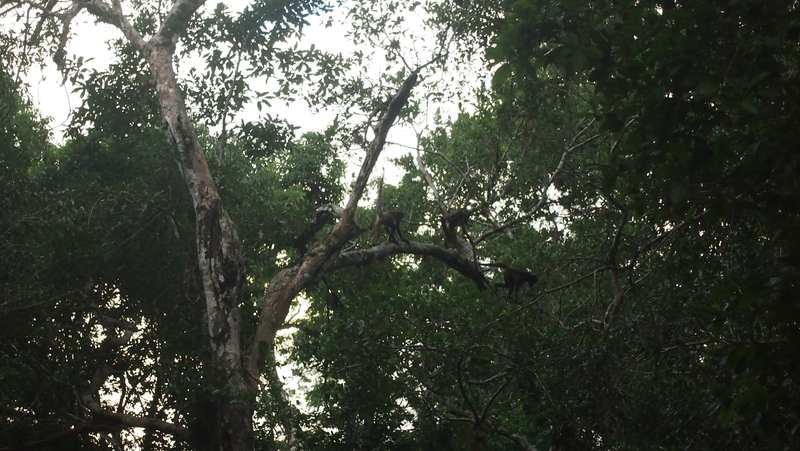 Monkeys undertaking important monkey business. 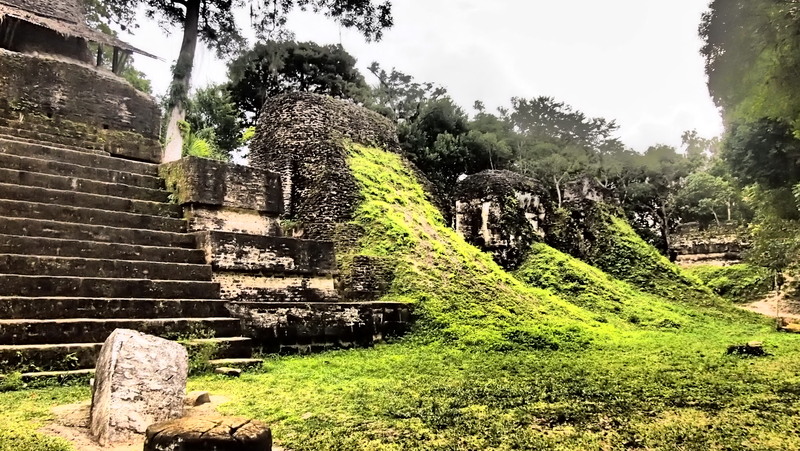 One of our favorite things about visiting the Caribbean coast of southern Belize and eastern Guatemala was learning a bit about the Garifuna culture. The Garifuna people are descendants of Africans who were condemned to slavery when their slave ships were shipwrecked in 1635 near the island of St. Vincent in the Caribbean. The fortunate survivors swam ashore where they lived freely and intermarried with native inhabitants from the Arawak Indian tribe. And then they lived happily ever after…until 1763 when colonial history’s arch villain, the British, intervened. The Brits didn’t like the idea of free Africans and Indians living peacefully on land they deemed perfectly suitable for profitable sugarcane plantations. To make a long story short, violence ensued and after some bloody confrontations, the British prevailed and expelled the Garifuna who ultimately resettled all along the coast of Central America. Today there are a few hundred thousand Garifuna people along the Caribbean coast, primarily in Honduras but also in Belize and Guatemala. Anyway, putting aside the history lesson and getting to the point, we were interested in learning about the rich, cultural tradition of the Garifuna. As such, we took a Garifuna drumming lesson and a cooking class, which at some point evolved into an impromptu musical performance and dance lesson. Thankfully, the camera man recording these festivities (me) couldn’t record and dance simultaneously, so there is no footage of my feeble attempt. I’ll skip the background of how we found ourselves stranded in the tiny, Honduran coastal town of Nueva Armenia. It’s a long story and a topic for a future post. 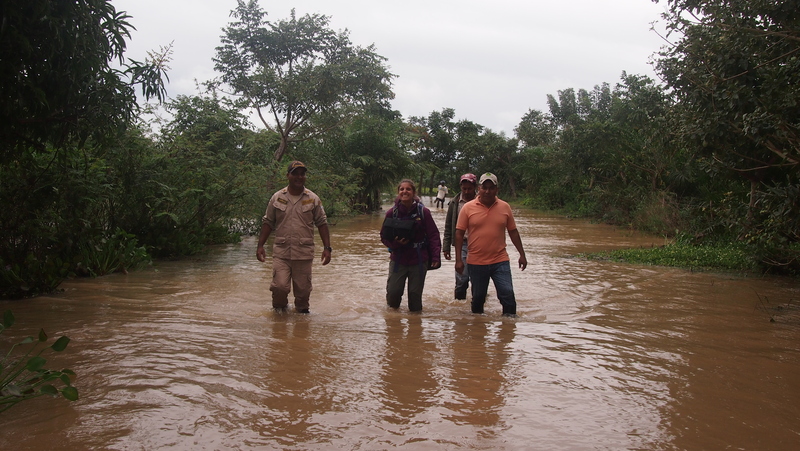 Suffice it to say that when we finally arrived there after a rather harrowing boat ride through a storm from the island of Cayo Cochino, we had no idea that the nearby Rio Papaloteca had burst its banks, cutting off every road out of town. It was only when we had been waiting at the local bus station for nearly an hour that we got our first inkling that we were in a bit of pickle. A villager carrying a machete and bundle of bananas stopped to exchange pleasantries. We told him we were waiting or the bus. 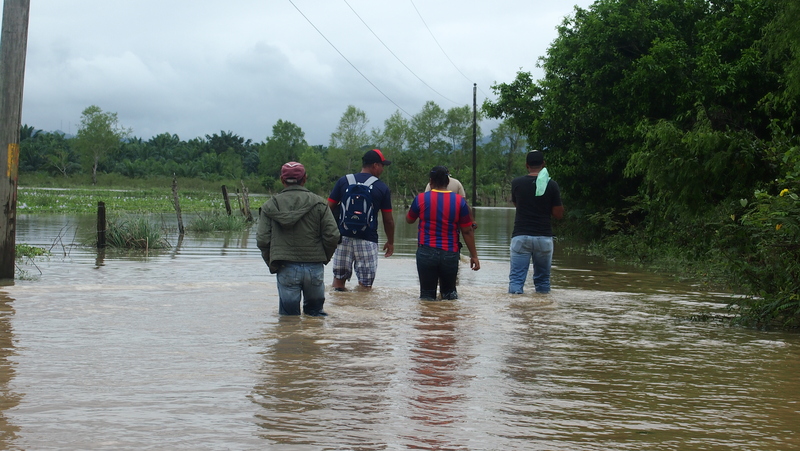 Although we didn’t understand everything (our conversation was in Spanish) he said something to the effect of, “Mucho agua, la calle es cerrado…no autobus hoy” (essentially, the road is flooded and there’s no bus running today) and motioned to his waistline indicating the flooding level on the main road. We got the point. Suddenly, it hit us that we were in a bind. There are only two ways out of town–by road and by boat. Given the flooded roads, option one was apparently out. We returned to the docks and realized option two was out, too. The only boat captain crazy enough to go out in the storm had hightailed it out of there as soon was we paid him for delivering us there. 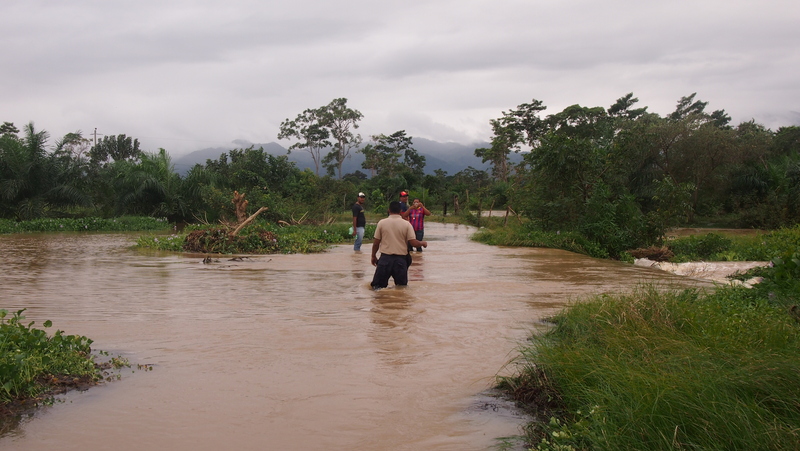 Waiting for the flood to recede was also out of the question as this tiny town didn’t have a single hotel. Up to this point in our travels through Honduras, we had been trying to keep our heads down and keep to ourselves. Elsewhere in Central America we had been fairly outgoing, always looking for a chance to practice our Spanish with the locals. We were more cautious in Honduras, however, because the country suffers from a reputation for violent crime (it currently has the highest murder rate in the world) and tourists have at times been targets. Knowing this, we were already on edge. At the same time, we knew there was no way we were getting out of our bind without the help of strangers. We started approaching friendly-looking people and asking them for help. I relaxed quite a bit when a very friendly abuela greeted us with a very warm “Bienvenido a Nueva Armenia!” and started hugging and kissing Elena. Eventually, we were pointed in the direction of a group of about half a dozen people milling about wearing river-wading boots. One of them appeared, from the looks of his uniform, to be a police officer. That raised alarm bells for me. By this point on our trip, I had been conditioned not to trust the police. This was particularly true in Mexico where the locals had warned us to avoid them since they often work with organized crime and have been known to extort money from or set up tourists for robberies. I suppressed my nerves, knowing we had no choice, and we approached to ask for help. After explaining our situation the best we could (our Spanish had progressed greatly by this point but we still weren’t fluent), they told us to follow them. So off we went, trudging down the muddy dirt road into the unknown. About half an hour later when we finally forged the worst of the flooding, I realized we were going to make it out in one piece. As we started joking around and taking selfies with our new friends (and saviors) I felt deeply relieved and very grateful. When we reached dry land, we hitch-hiked on the back of a couple of pick-up trucks which eventually delivered us to the bus station, where we caught a ride back to our destination where a nice, dry hotel room awaited us in La Ceiba. The experience was an important reminder that despite whatever reputation a place might have, there are always decent people out there and sometimes it’s OK to rely on the kindness of strangers. I am an avid runner and when I’m in my regular routine, I log about 35 miles a week. On the road it can be very difficult to find places to run (not to mention the time), so I often have to wait several days or even weeks between runs. That is one of the greatest challenges for me on the road. However, on the bright side, when I am able to sneak in a run, it’s often in a spectacular setting. 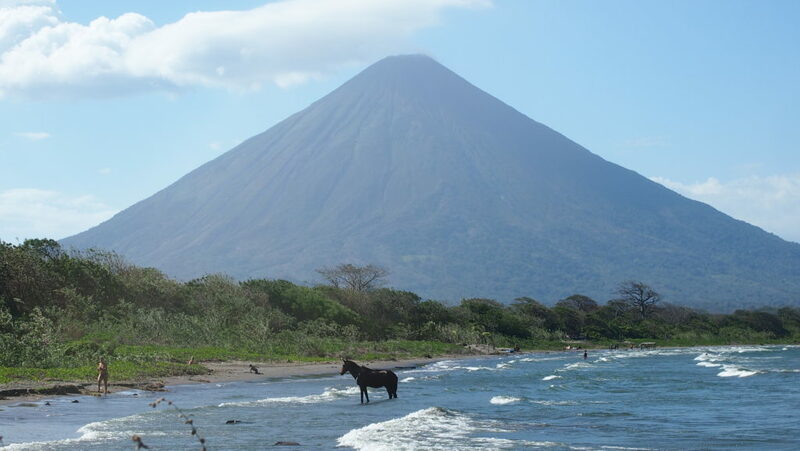 My first day on Isla de Ometepe was one of those occasions. I started out just before sunset on a rural road next to our homestay. 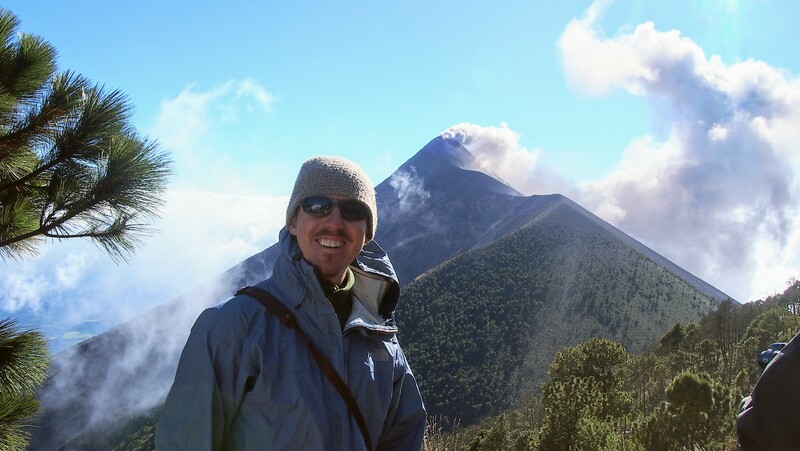 On my left, the massive Volcan Conception loomed impressively. On my right, the sun lit up Lago Cocibolca with a reddish hue. As I ran, the island’s rural character revealed itself to me as I passed banana plantations, herds of cattle and horses, and chickens running loose. I caught up to and ran alongside a tractor pulling a trailer full of hay and a dozen workers returning from a hard day’s work in the fields. They smiled and waived at the strange gringo. The children paused their games of soccer to giggle and practice their English greetings. “Hello, “Hi”, “How are you?” they called out in unison. Even the weather cooperated as the day’s extreme heat succumbed to the cool breeze coming off of the lake. I quickened my pace, energized by my surroundings, and wished the run could last forever. Since we had set foot in Guatemala we had been hoping to have catch of glimpse of the extraordinarily beautiful but extremely elusive Resplendent Quetzal. The bird, which is found in cloud forests ranging from Chiapas, Mexico, to southern Panama, was revered by the ancient Aztecs and Mayans (many of whom still consider it to be sacred). 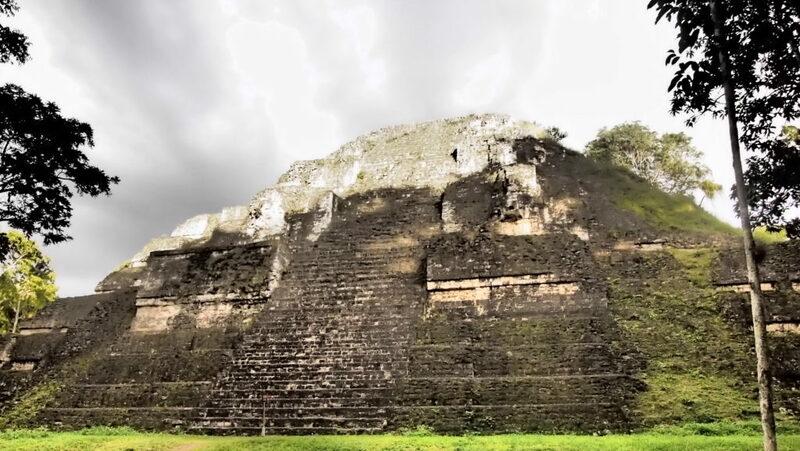 In fact, the ancient Mayans used quetzal feathers as currency and to this day the Guatemalan currency is known as the Quetzal. 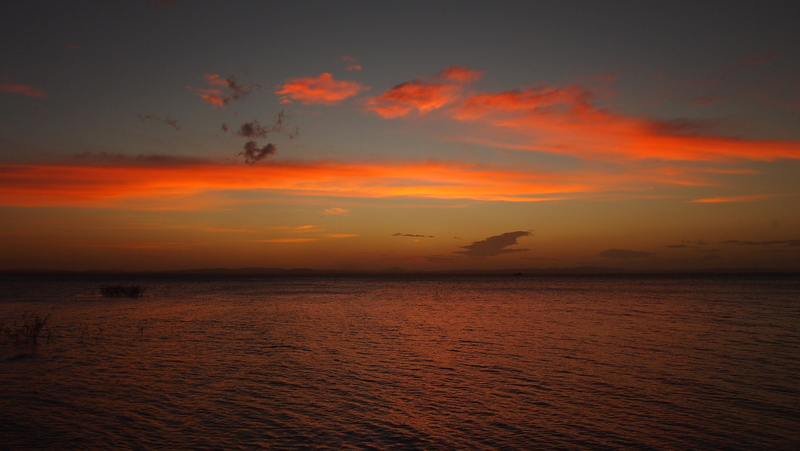 Alas, as we entered our last handful of days in Central America, we remained disappointed. Our last best hope for seeing the bird was at the cloud forests of Monteverde in Costa Rica. So, naturally, we were very disappointed and had basically given up hope when we returned from a long hike there without so much as a glimpse of the bird. Back at our hotel, we happened to run into a very friendly couple, Michael (from Massachusetts) and his wife, Sarah (from Madrid, Spain), who were also on the hunt for the quetzal bird and were similarly returning from an unsuccessful search that very day. They said they were going to make one last attempt the next morning. 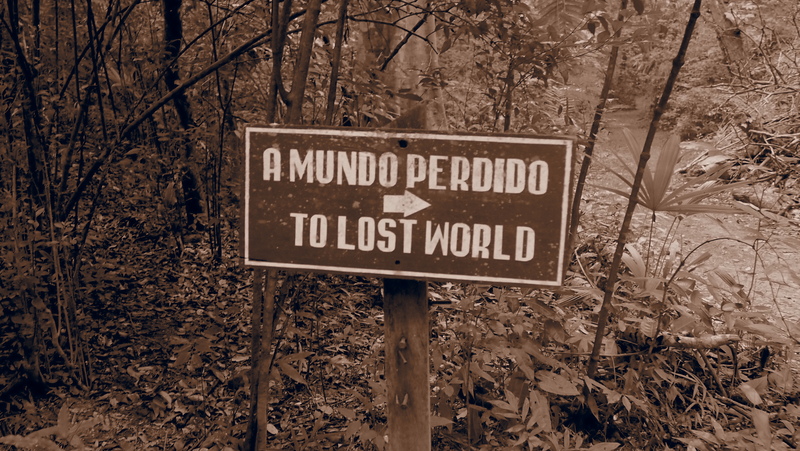 Their plan was to venture out near the entrance to the Monteverde Cloud Forest around dawn. They had been clued in by a local guide that there are a couple of quetzal birds who frequent the area every morning in the early hours before the hordes of tourists arrive. They kindly invited us along and we eagerly accepted. The next morning, the four of us piled into their rental car at the crack of dawn and set out with dreams of Quetzal birds fluttering through our sleepy heads. Just as we were approaching our destination Sarah exclaimed, “There, there, there, STOP!”. Michael hit the brakes and we excitedly leapt out of the car. 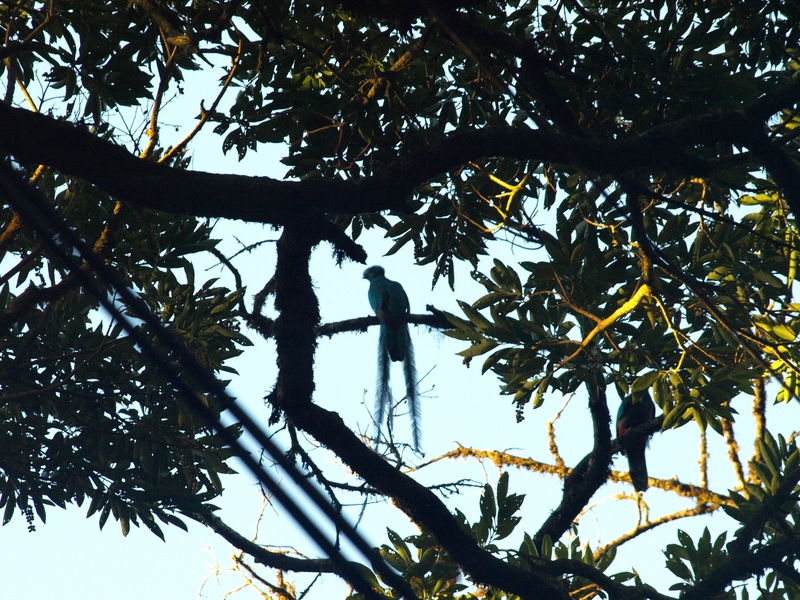 Sure enough, there on the branches of a tree right above our head was perched a male quetzal. 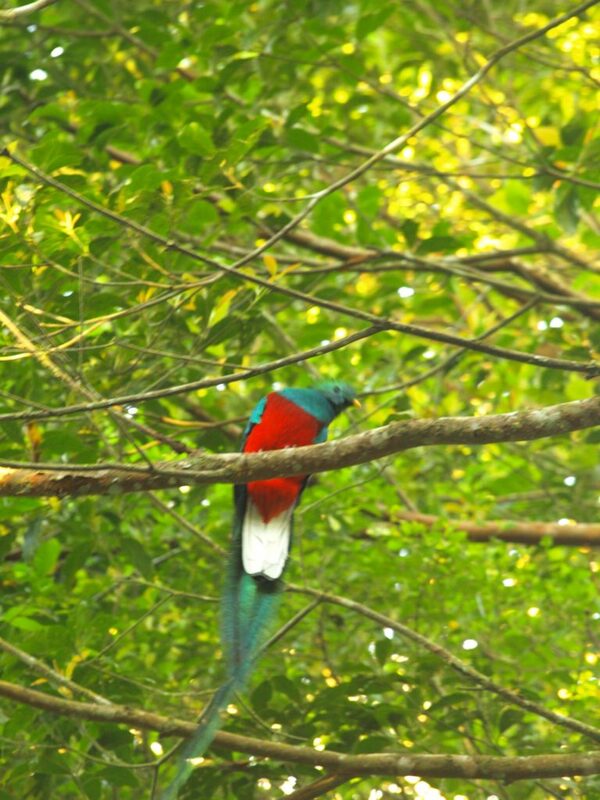 As we stood there in awe, barely believing our eyes, a second female quetzal swooped in to join her mate. They seemed to perch there for an impossibly long time as we gazed up and frantically snapped shots. As if to further indulge our photographic impulses, they shifted branches a couple times, yielding different angles from which to admire their brilliant plumage. When they finally scooted off deeper into the woods and out of sight, we just stood there, speechless and barely believing what we had just seen. Our travels are very loosely structured, to put it mildly. The “plan” when we left California in August 2016 only really included a few firm elements in terms of where we were going and when, and even these were flexible. The only thing on our itinerary that we absolutely did not want to change was our plan to spend Easter of 2017 somewhere in Greece. One thing we’ve learned on our travels is that usually (though not always) when we’ve gone someplace where we’ve planned a lot and had high expectations, it’s easy to be disappointed. Whereas when we’ve gone places or done things where we’ve done little or no planning and have no expectations, we are virtually always pleasantly surprised. 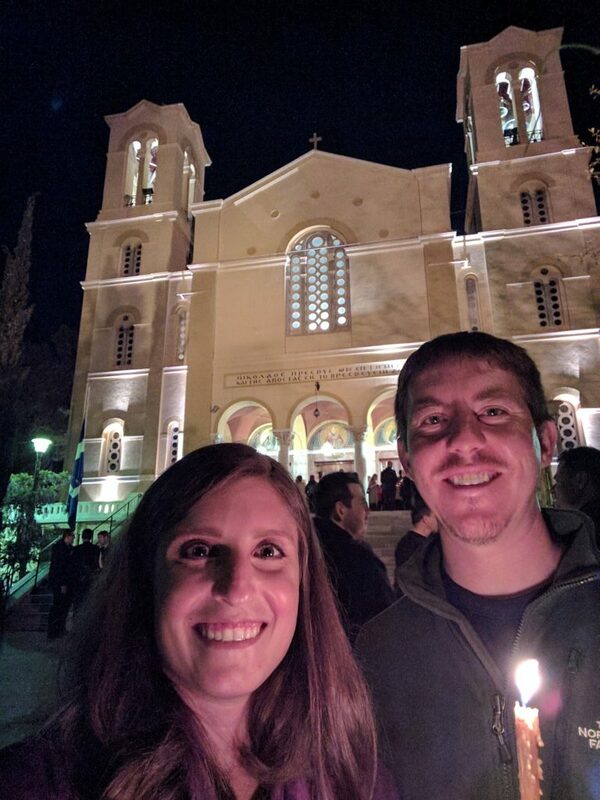 With that in mind, we were nervous that having built much of our trip around making it to Greece for Easter, we were setting ourselves up for disappointment. In an attempt to counteract this, we decided to simply book ourselves a flight to Athens about a week before Easter Friday and just wing it from there. As such, I don’t even remember how exactly we found ourselves at St. Nicholas Church for the Good Friday service. 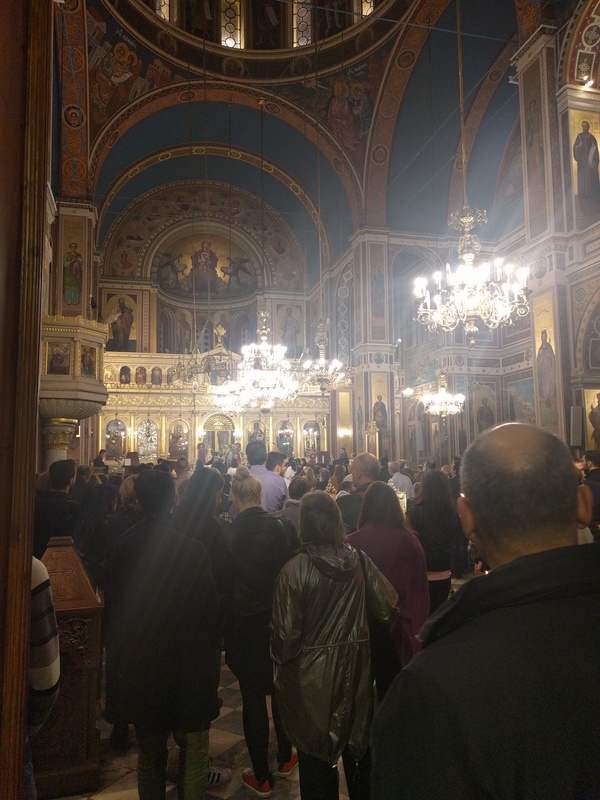 There is not much to distinguish it from the hundreds of Orthodox churches in Athens, except that it happened to the the closest church to our temporary home in the Exarchia neighborhood. Although I am not a very religious person myself, I very much respect and appreciate Elena’s Orthodox Christian beliefs. I also find religion fascinating from an anthropological standpoint. It was through this lense which I viewed my experience on Good Friday. 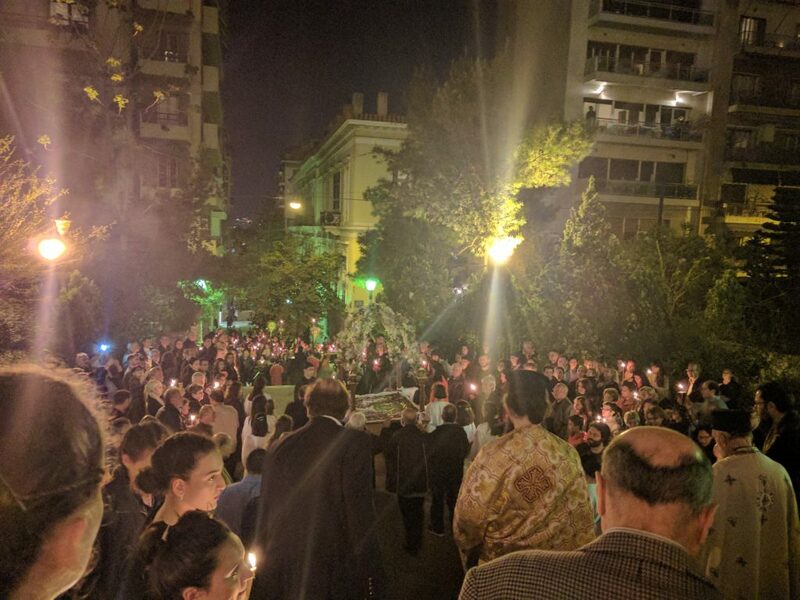 As we accompanied the congregation on their nighttime procession through the city streets, we carried candles symbolizing the spreading of the word of Jesus Christ. As I stared into the sea of candles and listened to the worshippers chanting hymns, I reflected on the power of collective action, whether it be in political protest, celebration, or religious ritual. It was humbling and deeply moving to participate in a ritual which Orthodox Christians have been carrying out more or less continuously for well over one thousand years. This list started as a top ten, but there were a couple of memories I just couldn’t bear leaving off of the list. In fact, it was hard limiting it to 12 memories. It could have easily grown to 15, 20, or even more. However, my intent was not to create an exhaustive list. Rather, my goal is to give a little insight to our friends and families into why I love to travel. I hope this post also helps to explain, at least in part, what motivated me to embark on our journey and what inspires me to keep going, even when we have challenging days.